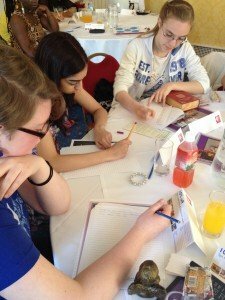 Five interactive workshops on the art and craft of writing. See our speaker line up below. Special performance by young writers from WAPPY at lunch time – READ about WAPPY on jaBlog! 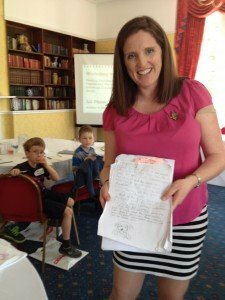 Parent Q&A session with Laura from 4:00 – 4:30 on how to support and encourage your young writer. This is included in the registration fee and attendance is optional. For those wishing to stay at the Manor House Hotel, there is a special delegate rate for bed and breakfast on Sunday night. Please email Laura for more information. Every young writer who comes to the conference is welcome to submit a piece of writing for our special conference writing contest. The top two winning stories will be read at the conference and be considered for publication on jaBlog! in May/June. READ the winning story. 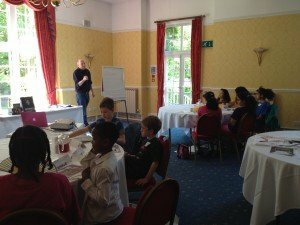 Write a short story (fiction) of no more than 500 words that is set at the Manor House Hotel (the location where the Conference is taking place). Click here to visit the hotel website and see what it looks like. Please put your name, age, email address, and title at the top of the first page of your story. Email to Laura no later than Saturday, May 10, 2014. You must be registered for the conference to participate. Laura Michelle Thomas, B.A., B.A., M.A., is an author and professional copywriter and ghostwriter. She has been mentoring young writers in workshops, camps and courses since 2007. She has worked equally with homeschoolers and students in public and private schools, including those in gifted programs. Some of her students have gone on to have stories and poetry published in prestigious magazines like Stone Soup. She is also a mother with a daughter and step-son and a professional children’s storyteller, who was storyteller in residence at Science World, Vancouver for 2012. Laura also has experience working with writers with special needs, including autism spectrum and ADHD. 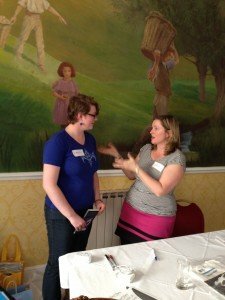 More recently Laura formed a communications company through which she fosters the development of young writers worldwide through quality contests, conferences, blogging, books, and educational resources. 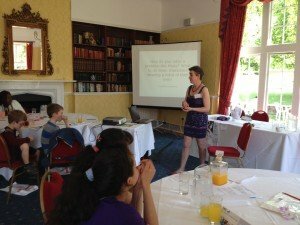 She is the author of Polly Wants to Be a Writer: The Junior Authors Guide to Writing and Getting Published. The Junior Authors Conference is specially designed to recognize, affirm, inspire, and delight young writers ages 9 through 21. The workshops will be kept short. There will be lots of breaks, good food and opportunities to meet other young writers and some industry professionals. The workshops are interactive and fun. All presenters have experience working with children and youth and will deliver workshops that are appropriate for this age group. Click here to view a video from our 2013 Conference in Vancouver, Canada. Read testimonials from past participants. Specially designed for younger writers – Please see note below if your child is under 12 and you are concerned about them attending on their own. Students with special needs may bring an authorized support person with them for the whole day at a reduced rate which includes lunch and all snacks. Please contact Laura to make arrangements. 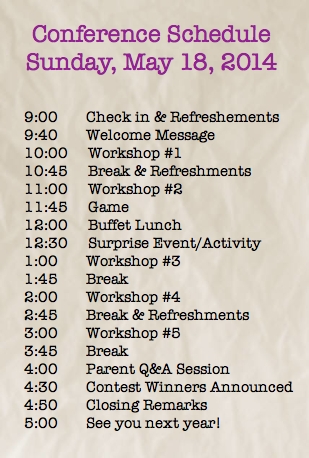 We will be staying in one large ballroom together all day for all workshops and meals. Everyone will be seated at banquet-style round tables. LTC volunteers and staff will be available to assist younger participants. Read jaBlog!’s interview with Katherine in the March edition. Using proven skills, Katherine will show participants how to write characters that readers will remember long after they put the book down. The focus of the workshop will be on defining what your characters want, why they want it, and why they can’t have it. She will demonstrate, using current books and movies as examples, and then lead the participants in a hands-on exercise where they can develop their own protagonists. Participants will leave the workshop with a character fleshed out and the skills they need to continue their protagonist’s growth throughout their story. Katherine Garbera’s first published novel The Bachelor Next Door, sold to Silhouette Desire in 1996. The book immediately set the bar for the titles to follow since the editors selected her as a “woman to watch.” Katherine hasn’t let them or her readers down, publishing more than 50 books since then. She has broadened her writing skills to include writing for Harlequin Blaze, Harlequin NASCAR and the short-lived but much acclaimed Silhouette Bombshell (a series which featured strong heroines who both got the guy and saved the day). She’s a two time winner of the prestigious Maggie Award for Excellence and multiple RT Bookclub award nominee. 2007 saw the launch of her highly acclaimed mercenary series The Savage Seven. The Pirate caught the attention of the editors at Cosmo and it was selected as a Red Hot Read in 2010. Her books have been featured in magazines such as REDBOOK (11/98) and have even been displayed on the large JumboTron in Times Square, and excerpted in COSMO (7/10). Teen writer and LTC Team member, Katie King, interviewed Ian for jaBlog! Voice, register, and point of view are frequently more flexible elements than we tend to suppose. 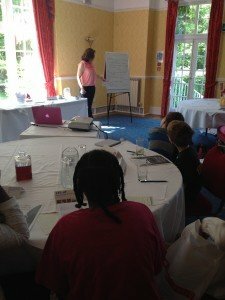 Drawing on his wide experience ghostwriting (and speechwriting), this workshop aims to help young writers feel for themselves the liberating effects of writing as someone else, both in fiction and non-fiction. 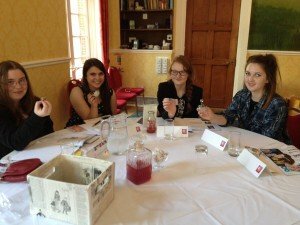 Just as young people often enjoy dressing up and assuming a different persona, this workshop offers an unusual invitation to attend a literary fancy dress ball and try on a variety of unfamiliar guises and alien forms. Ian’s workshop will help developing writers choose and manipulate perspective (point of view) in fiction and non-fiction. Ian Shircore is a former business journalist and author of nine books in his own name – most recently John F Kennedy: The Life, The Presidency, The Assassination (Andre Deutsch, Oct 2013) and Conspiracy! 49 Reasons to Doubt, 50 Reasons to Believe (John Blake Publishing, 2012). Ian is also a busy and versatile ghostwriter. At this moment, he is working, in parallel, on two ghosting projects. Ian has also worked as a journalist in Sydney, Australia, and on the South China Morning Post newspaper in Hong Kong. He now lives and writes in Woking, just on the edge of the Guildford area. Our UK Blogger, Rhianna Urquhart, interviewed Lil recently. You can read the article on jaBlog! Have you ever started writing a book and then lost your hunger for it? Got an idea for a story but don’t know how to keep it interesting? In this workshop author Lil Chase will talk you through the steps needed to write an intriguing story, and the different ways you can keep the reader – and you, the writer – excited enough to devour your book and be satisfied. Participants will come out with a fully fleshed out idea for a novel with a clear beginning, middle, and end. Lil Chase is the author of two books: Boys for Beginners and Secrets and Lies, and Locker 62. Her latest series, The Boys’ School Girls, will be out in July 2014. All published by Quercus. Lil also works as a commissioning editor at Working Partners Limited, creating fiction for children and adults. jaBlog! contributor, Lindsay Warner, interviewed Grace for us. This workshop seeks to empower its participants to draw out their thoughts in order to create a poem or a short piece of prose which can be performed confidently and submitted for publication. It is just as much an interactive process of merging art with creative writing, as it is about the product(s) of that art and writing; that is, from the point at which the pen touches the paper, under the control of the writer, to produce a creative publishable piece, that will enable the writer to “give voice” through its performance. Former university lecturer, Akuba (aka Grace Quansah) began Spoken Word performances from 1997. Her achievements include Aspiring Female Storyteller (Black Women in the Arts, 2006/2007), and winner of Random House Children’s Books writing competition (2006). “The Awakening of Elmina” is published in Malorie Blackman’s, Unheard Voices (2007) and was performed at Cape Castle (Ghana) for Panafest 2007 for Abolition/Ghana independence commemorations. She is published in nineteen different collections including in Journeys Home (US, 2009), and co-edited The Soul of a Child with Maureen Roberts, 2011 (Bogle L-Ouverture Press). 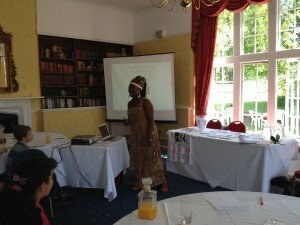 As a Ghanaian-descended mother of four, in primary and tertiary education, youth and media work, Akuba enjoys empowering young people to achieve “against the odds.” Initially under Positive Awareness and funded by the London borough of Ealing in 2008, she established WAPPY (Writing, Acting and Publishing Project for Youngsters). It develops the literary, literacy, art and performance skills of young people (5 – 18 years), and creates opportunities for performance, exhibition and publication. Since 2006 she’ has been working as a Schools facilitator within the British Museum. She is also a community and cultural activist, working across London in different educational and heritage sites to empower young people, in particular, those experiencing adversity and struggle to “give voice” on all kinds of themes. Read Avery St. Pierre’s interview with Charlie on jaBlog! Some people are plot driven, while others write by the seat of their pants. Neither is the only “proper” way; many writers employ a mixture of both. Even Agatha Christie had a setting, with a list of characters, before playing around with who murdered who and why. This workshop will look at specific problems which can arise between carefully prepared plot lines and the characters which inhabit them and practical ways to deal with characters who don’t want to conform to your ideas. Charlie will talk about what happens when you have let either plot or character run amok and what you can do to retrieve the situation, in particular the issue of overcoming writers’ block where the problem has reached a stalemate. As Charlie Cochrane couldn’t be trusted to do any of her jobs of choice—like managing a rugby team—she writes, with titles published by Carina, Samhain, MLR and Cheyenne. Charlie’s Cambridge Fellows Series of Edwardian romantic mysteries was instrumental in her being named Author of the Year 2009 by the review site Speak Its Name. She’s a member of the Romantic Novelists’ Association, Mystery People, International Thriller Writers Inc and is on the organizing team for UK Meet for readers/writers of GLBT fiction. She regularly appears with The Deadly Dames. Why financial aid is needed to attend this conference. Why the student wishes to attend this conference. A brief description of the student’s writing goals and career aspirations. You must be on the LTC Insider Mailing List to qualify for this scholarship. To sign up, please enter your email in the form on the top, right side of this page. Send the email by May 5th, 2014 to Laura Thomas at laura@laurathomascommunications.com. Please note that the scholarships cover all or a portion of the conference registration fee. We do not provide funding for travel or other miscellaneous expenses. On or Before May 11 – Refund less a 5% administration fee. Please make your request by email. Between May 12 and 17 – Refund less a 15% administration fee. Please make your request by email. 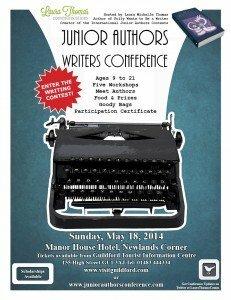 For more information about the Junior Authors Writers Conference, please contact Laura at laura@laurathomascommunications.com or leave a comment below. Please let me know if you are planning to have set up conference in Toronto. I am 13 years old and I will like to participate. Hi Lily. The best way to follow the expansion of the conferences is to be on the LTC Insider mailing list. Hi Laura! It looks like the winners will be announced at 4:30 UK time, but I was wondering what time the winners would be announced on the website, because I live in Michigan and can not attend, but am finalist. Also, will the ceremonies be broadcasted anywhere? Hi Allyssa. Please see the 2013 poetry contest FAQs and fun facts page for answers to your questions. The FAQs are under the statistics. And I will be sending reminders to the contest mailing list as we get closer to the big day. I would love to be a part of your conference though I would have to face certain hardships. I would like to know on what basis do you provide scholarships? Hi Kiera. The application information is on this page, underneath the speaker and workshop information. We can help cover the cost of the registration fee. I was thinking about applying the scholarship as it sounds great but I would be unable to attend otherwise. Do I email the details or my mum, and if she does does she have to be a LTC insider too?? Hi Bee. You or your mom can email me. It’s up to you. She does not have to be an Insider. My name is Lelia and I only recently found about your geniusness (yes I know that isn’t a word) and I think it awesome that you are hosting something like this. I will be in attendance of the conference in October in Vancouver (2014) because my home base is there, and since I’m in Europe at the moment I’m hoping I can convince my mum to somehow maybe let me come in May!!! Hopefully she will let me, this sounds like so much fun! Thank you so much for setting this up, I can’t wait to finally participate in something, whether it be in May or October. Hi Leila. Thanks for your note. I really look forward to meeting you at one of the conferences. Hi, follow up, unfortunately I can’t go to the conference for some unidentified reason but that’s ok. I’m already bursting with excitement for October. I’m hoping to enter the contest for that. Awesome. We’ll see you in October in Vancouver. I’ll email the Insider List when early bird registration opens. i love to be in this conference, i have authored some books so let me know what to do. I am very glad you found us. Wow! You’re coming to England! I am so going to have to get my mum to get tickets to come! Can we sign up to a list that tells us when the tickets are out? It’ll be just after my 16th, too – best birthday present! Hi Hannah. I’ll add you to the list of people who want to know when early bird tickets go on sale. Hey Laura, have you decided for the venue in 2015? We are currently working on 2014. I’d like to recommend you to come to India. Me too. I’ve never been to the UK. UK is splendid! There’s so much to see and do! When your in the UK will you visit London? You should! It’s amazing.